Arguably the most famous Indian dish in Britain, the classic Tikka Masala came to even more prominence when a UK foreign secretary proclaimed it to be 'Britain's true national dish'. Every time we take a mouthful of this deliciously creamy and flavoursome dish, we remember all over again why it is so beloved. This recipe makes it the classic way: marinating the chicken first and then cooking it in the curry sauce. As an optional first step, marinade the chicken first with the yoghurt and 2 tbsp. Spice Paste. Then either grill it separately, or add it uncooked into the sauce and allow to cook through. Heat oil in a medium saucepan. Add the onion, and cook until soft. 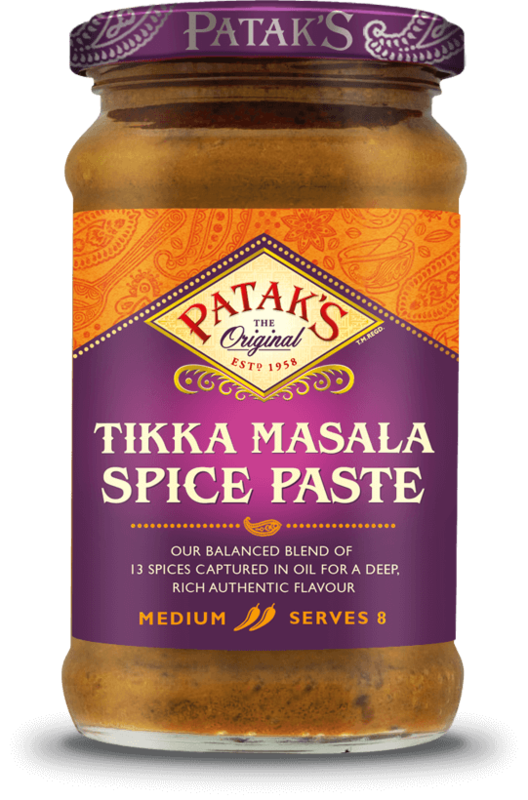 Add Patak’s Tikka Masala Spice Paste, 100ml of water, and the ginger & garlic (if using). Stir occasionally, until your sauce is reduced and thickened. Add the chicken, cook until sealed. Add 100ml water and the tomatoes. Bring your curry to the boil, and simmer un-covered for 10 minutes. Add the double cream and a pinch of sugar (optional). Simmer un-covered for 5 minutes.